- 【Remote Control】Plug the device into the WiFi socket mini and you can use Tuya App to control them anywhere.No Hub Required. - 【Timing Control】The timer plug socket enables you to create schedules to automatically power on or off your home electronics. - 【Voice Control】Control your home appliances with the wifi smart plug by simply giving a voice command to Amazon Alexa or Google Home. 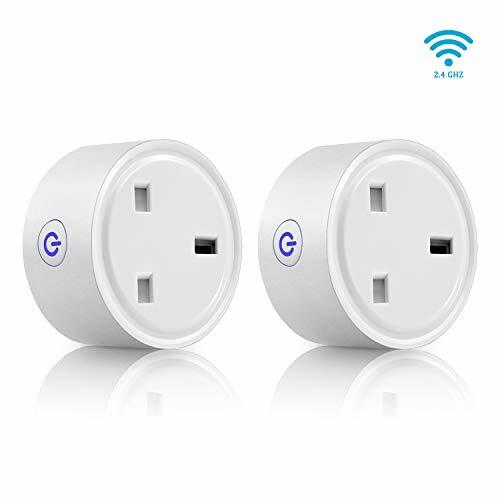 - 【Overload Protection Technology】When the wifi smart plug detects that a connected electrical device is overloaded, the socket automatically disconnect the power to protect the device. - 【Self-Closing Sockets For Kids Safety】The socket slot with Sliding Safety Cover will prevent children from inserting fingers or other objects into it. Its shape is a circle with a radius of 1.05 inches, so it doesn't affect the usage of the most outlet switch.